One of the most common signs of a congenital malformation is missing one or more of your teeth. Over 20 percent of people lack at least one of their wisdom teeth. Over five percent lack at least one upper second incisor or second premolars. It is much rarer, however, to lack many teeth. Luckily, there are more tooth replacement options and they are more accessible than they have been previously. Your options will depend on your overall health, age, financial capabilities, and quantity of bone. Why Do I Have Congenitally Missing Teeth? In most cases, the condition occurs due to a lack of the dental lamina, the band of tissue under the gums. The tooth forms out of this tissue band so if there isn't dental lamina, there won't be a tooth. There are a few genetic factors that can stop this band of tissue from forming. Scientists have found three specific genes that affect tooth development and any problems with the genes can result in a lack of tooth. In some cases, hypodontia is also linked to Down's syndrome. Some dentists even claim that we are currently undergoing an evolutionary change in the quantity of teeth. They predict that instead of the 32 teeth (including wisdom teeth), future humans will have about 20 teeth in total. Congenitally missing teeth will indeed be passed to your children due to its genetic pattern. However, no dentist can yet predict which or how many teeth will be missing. Will It Affect How I Chew or Talk? Having missing teeth usually will not impact your ability to talk or chew. However, when you are missing many teeth, especially in the back of your mouth, chewing can be impacted. Will It Affect the Shape of My Face? It is possible for these missing teeth to affect your facial shape due to less bone in the jaw area near the missing teeth. The quantity of bone within the jaw can also be affected. Even so, only severe cases of hypodontia will result in changes to your facial appearance. Dentures can be used like real teeth, but they are removable. You take them off at night so your gums can rest. Your dentist can fit you with proper dentures in just a few appointments. Dentures tend to last a long time and can be refit as your mouth changes. 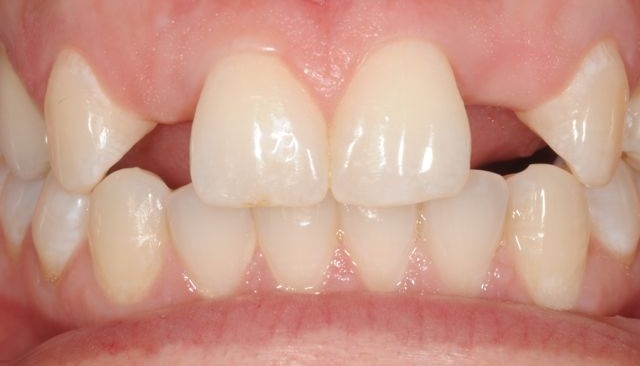 Bridges are fixtures that can be put on a gap between your teeth. Your dentist installs a replacement tooth with crowns on both sides. This is a good option for those who need crowns on the teeth surrounding the missing one, but dentists prefer other alternatives if those teeth are healthy. Bridges also won't work if you are missing several teeth in a row since it needs support in the middle or ends. Dental implants are titanium screws that go in your jaw bone and make room for a bridge, denture, or crown to be joined. According to the American Dental Association, implant is the ideal option for replacing congenitally missing teeth since it is among the most successful dental procedures and the implanted tooth looks just like natural teeth. The downside, however, is that not every patient will be eligible for dental implants. The screw needs to have at least 6.5 millimeters of room between the adjacent teeth. Also, your dentist won't install an implant if your teeth are still growing. Stem cell therapy should hopefully be an available option in the future. Dental tissues contain various types of adult stem cells and researchers have used these to help grow portions of teeth. One study even regrew the entire tooth root. They can then implant the root in the jawbone and put a crown on top. The treatment has been successful in pigs and testing will hopefully be done on humans in the near future. What's That Dangly Thing at Back of Throat?